At moment there’s a rare chance to see a little-known work by Titian in London. Partridge Fine Art is displaying a Saint Sebastian from his hand as part of a a major show of old master paintings (runs till July 18). I haven’t yet been, but I’m familiar with the picture, which I’ve seen in New York. It is quite beautiful and especially the wonderfully evocative, moist evening-lit landscape is remarkable, and leaves no doubt that the master himself painted it, even if assistants may have been responsible for laying in the figure. 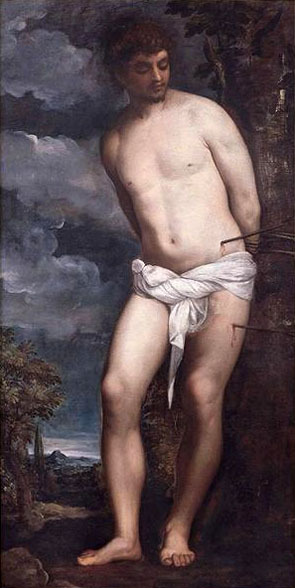 Possibly identical with a canvas sent to the duke of Mantua in 1530, and in any case roughly datable to around that year on the basis of its style, the figure of Saint Sebastian as we see him here very close to the one Titian painted as part of his Saint Nicholas altarpiece, now in the Vatican. The most likely scenario is that it was developed for that composition and extracted for the present canvas while the larger composition was still being completed (there is disagreement as to when the latter was finished, but it seems most likely to have been in the mid-1530s). 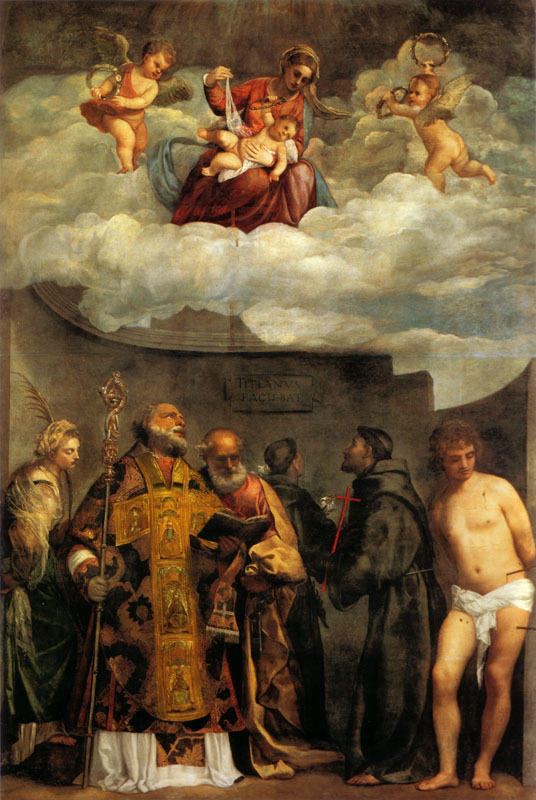 It is thus a prime example of how Titian would recycle his inventions, extracting them from one composition and inserting them in a different context. Though by no means an uncommon practice amongst Renaissance artists, Titian’s way of doing it was highly original and bears witness to a constantly fluctuating creative mind, rethinking and reworking his ideas again and again throughout his career. The figure as it appears in the Saint Nicholas altarpiece aroused both admiration and disdain for its unabashed naturalism at the time. Compared to most contemporary portrayals, including Titian’s own famous, monumental version of the figure seen in the so-called Averoldi Polyptych in Brescia, painted between 1519-22, this Sebastian is surprisingly unidealised. A pale, comely and somewhat flabby youngster with a hint of baby fat around the cheeks. In comparison, the Sebastian in the picture on display in London is bearded and darker of complexion, possessed of greater spiritual fervour in his downcast gaze, face in shadow. The actual execution of his body and skin leaves something to be desired, however and was probably largely carried out by assistants with Titian putting on the final touches. The dusky landscape, however, is all him. It is painted in beautiful azurite with a lush hint of purple suggesting the dew caught on the sun’s waning rays. The handling is broad and energetic, not the least in the dabs connoting the bark of the tree to which Sebastian is tied. Another piece of evidence that Titian — who is famous for the open brushwork of his later years — began selectively loosening his hand much earlier than was once thought. In some ways like Sebastiano del Piombo’s Viterbo Pietà, which I wrote about here recently, although a lot less forceful in effect and ethos, it evokes the intuitive connection we make between waning light and life. It however lacks that pictures oppressiveness, the nourishing humidity of the air seemingly promising dawn at the other end.